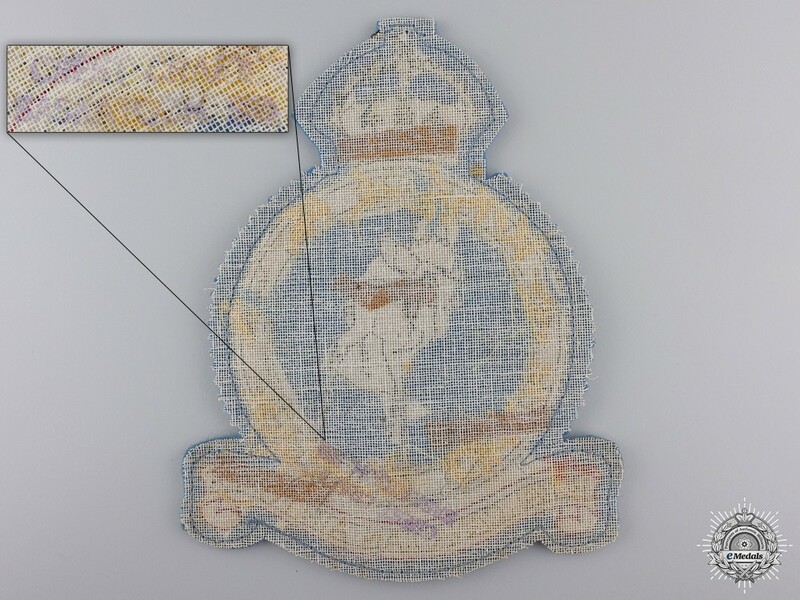 A Second War RCAF Station Alliford Bay Jacket Breast Patch - Multi-piece construction, fabricated from pieces of red, white, light yellow, dark yellow and ultramarine blue felt, sewn upon a light blue felt base, black highlight stitching in the crown, illustrating the Disney character Bambi standing in snow in the centre, the lettering in the circle, "ALLIFORD BAY" and "BRITISH COLUMBIA", along with that of the ribbon banner, "ROYAL CANADIAN AIR FORCE", in dark yellow embroidery, the outer edges of the circle in light blue embroidery and the outer edges of the ribbon banner in red embroidery, white mesh backer stamped "CREST CRAFT SASKATOON" on the reverse, 122 mm x 153 mm, extremely fine. 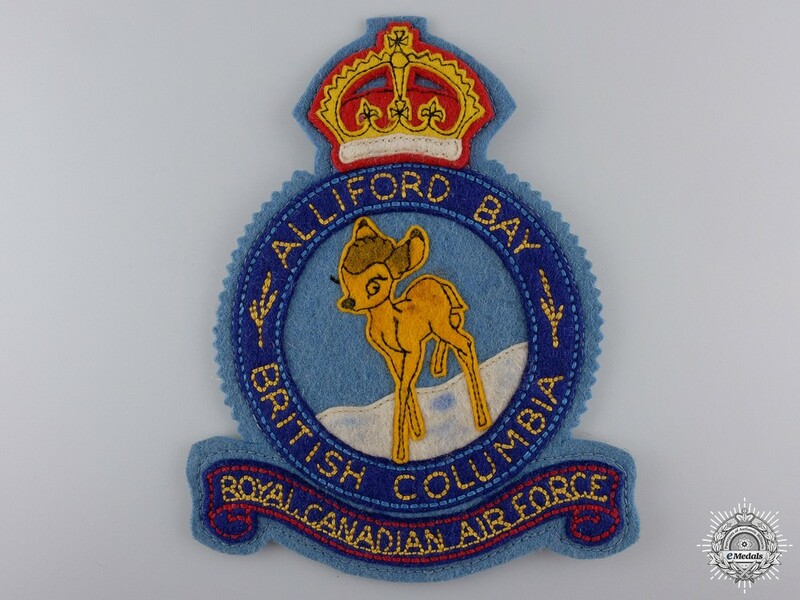 Footnote: RCAF Station Alliford Bay, located on Queen Charlotte Island off the coast of British Columbia, was originally built as a Royal Canadian Air Force seaplane base and operated during the Second World War, flying PBY-5 Catalinas. From 1941 to 1943, the RCAF placed its High Frequency Directing capabilities at the disposal of the Royal Canadian Navy. The RCN complement was approximately four to six operators, with the station playing an important role in the RCN's radio intelligence operations against the Japanese. It base was shut down in 1945, with the community of Alliford Bay gradually transitioning into a logging centre.